Exploring the intersection of religious sensibility and creativity in the poetry and prose of the American modernist writer, H.D., this volume explores the nexus of the religious, the visionary, the creative and the material. 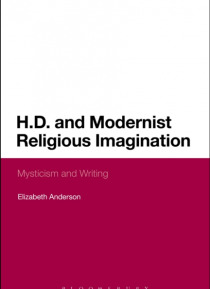 Drawing on original archival research and analyses of newly published and currently unpublished writings by H.D., Elizabeth Anderson shows how the poet's work is informed by … a range of religious traditions, from the complexities and contradictions of Moravian Christianity to a wide range of esoteric beliefs and practices. H.D and Modernist Religious Imagination brings H.D. 's texts into dialogue with the French theorist H l ne Cixous, whose attention to writing, imagination and the sacred has been a neglected, but rich, critical and theological resource. In analysing the connection both writers craft between the sacred, the material and the creative, this study makes a thoroughly original contribution to the emerging scholarly conversation on modernism and religion, and the debate on the inter-relation of the spiritual and the material within the interdisciplinary field of literature and religion.